This week I (and inadvertently Gatsby) am featured on La Bella Figura along with 8 other fashionable bloggers. We all share our fashion insights and are pictured in our "go to outfits". I am the third blogger featured... see if you can spot Gatsby! It turned out Madame Bohemienne had just visited Brittany and had brought back with her an entire crate of fresh oysters. I nearly fainted with delight. Now many people do not like oysters. I am not one of those people. I love oysters. Mon Dieu how I love oysters! And I had never seen so many before my eyes as I had in that moment. I eagerly helped BP and her two sons set the table. Oysters were shucked, music was playing, we opened a bottle of champagne to celebrate and we sat down to feast. Delicious is an inadequate word to describe that meal. The oysters (accompanied with mignonette sauce and big pieces of crusty French bread and real butter) were divine. The champagne bubbles delighted my tongue and left me feeling delirious. Afterward we ended with a delicious slice of Camembert. 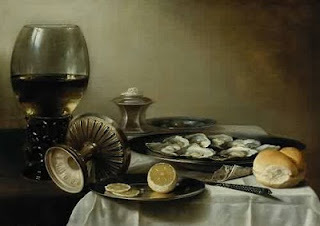 Still Life with Wine Goblet and Oysters by Pieter Claesz is pictured above (dated 1630). 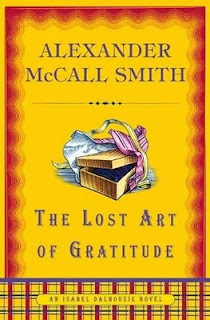 In The Lost Art of Gratitude, Alexander McCall Smith’s latest novel in the eternally enjoyable Isabel Dalhousie series, Isabel and Jamie discuss the theory that we are all Sisyphus, in our own way. I found this discussion to be particularly interesting. Probably because, when I studied Latin in high school, I felt extremely sorry for poor old Sisyphus. But then I got to thinking and realized that McCall Smith’s Isabel is actually right. We are all Sisyphus in our own way. My own Sisyphean plight involves such things as emptying the dishwasher, doing the laundry, filing in the office…. These rather mundane tasks always seem to be completed and then lo and behold, all too quickly after completion, need to be tackled again. I do, however, believe the key is (and I hope poor Sisyphus was able to come to this conclusion himself) to enjoy the journey and appreciate the cyclical nature of the task at hand. If I could somehow appreciate the unloading of the dishwasher (make it a meditation perhaps? ), enjoy sorting through the laundry (meditation again?) and relish the act of filing, then perhaps the cyclical nature of these tasks would not be as daunting. I would love to know… how are you like Sisyphus? Happy Valentine’s Day to all of my wonderful readers on The Daily Connoisseur. I consider myself to be very fortunate to not only have one, but two Valentines (Gatsby and B, you see) and this year is even more special because I have a big announcement… we are having a baby! This year for Valentine's Day I am giving my sweetheart (otherwise known as B) one pound of luxury chocolate from my favorite local chocolatier in Santa Monica, Chocolatt...from Belgium. I would love to know... what are you getting your sweetheart for Valentine's day? After I lived in Paris for a few months I started to learn the secrets of the city from the locals. Perhaps they waited to see if I was ‘worthy’ of being told the secrets or perhaps they had tried to tell me when I first got there but my French was so bad I didn’t understand what they were saying- either way I was grateful. It was at one of Madame Bohemienne’s wild dinner parties where a few artsy types were the guests of honor, that I learned about the Louvre at Midnight. “You haven’t heard about the Louvre at midnight?” they asked me astonished, as I had already been in Paris for a few months. Well every so often (usually once a week- but one could never tell- and never really on the same day) a group of musicians played a free concert in the courtyard of the Louvre at midnight. It was spectacular- so special, so romantic! We had to go. And go we did. I’m not sure how we found out what night they were playing as this wasn’t an advertised thing, but my friends and I, one crisp evening in early Spring, wandered into one of the courtyards of the Louvre and found a string quartet. Only a handful of people were scattered around the courtyard listening to the beautiful music. There were no chairs- people either sat on the edge of the fountain or on a blanket or scarf laid down on the floor. I spent the past weekend visiting my grandmother in the stroke rehabilitation center. My grandmother has had a tough month. She had a heart attack and two weeks later, a stroke. She is 87 years old- so these sorts of things tend to happen at her age- as my family so aptly reminds me, but it still doesn’t make it easier. I could easily describe my grandmother, you see, as the original Daily Connoisseur. She is a woman that does not take a moment of her life for granted. She drinks sparkling cider out of her finest crystal, drinks coffee (always black) out of her best china, watches the sunset every day she is able and has pie for breakfast whenever she feels like it. In short, this is a woman who knows how to live- and live well. She has been like this as long as I have known her. That is why when I saw her for the first time after her stroke, I was in for a shock. The normally vibrant lady I was used to- who loved going to jazz concerts on Sundays (she has a more active social life than I do)- was lying on a bed in the rehabilitation center, looking tired and weak- the left side of her face, slightly collapsed. I observed a quiet moment of sadness within myself but did not want to show it to her. After spending the day with her, however, I quickly found that her stroke was merely an annoyance- a bump in the road, and that her same spirit and sense of humor still prevailed. She was, after all, still wearing her trademark hot pink lipstick, bribing the male nurses with marshmallows and overall, being an incredibly good sport. I was happy to tell my grandmother that I have just completed my first novel and I told her when it is published (notice I said ‘when’ and not ‘if’- I am using the power of positive thinking here people) I will dedicate it to her. But until then, I dedicate this blog to her- to my grandmother, Lila- the original daily connoisseur. She taught me that life is worth living- but only if you live it well. And for that, I could not be more grateful. 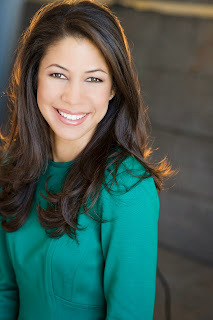 Last week, my post On Why We Don’t Use the Best Things We Have got an overwhelming response. So many of you could relate and we all asked ourselves the same question- Why do we do this? What are we saving our best for? Monday- Wore my favorite Intimissimi pajamas in cotton taupe with aqua blue lace trim to bed. I have never worn these to bed before. I’ve only worn them when staying over at my in-laws’ house as they are my prettiest pajamas and they tend to impress! Wearing them at home feels great… kind of like the equivalent of jumping into a perfectly laundered, freshly made bed. Wednesday- Walked Gatsby in my Hard Tail yoga pants, ballet top and hoodie (an outfit I usually reserve for hiking with girlfriends). Felt as though there were a spring in my step and for the first time in a while did not worry that I would run into somebody I know. Thursday- Wore my favorite J Crew cashmere henley in heather grey for the second time this week. Normally would shy away from wearing something twice in one week but when it is high quality and is the nicest warm sweater I have- pourquoi pas? Allowing myself to wear something more than once a week also curbs my ridiculous desire to buy too many expensive things- I don’t need that much… quality over quantity. Friday- Today I am lounging around the house. The cleaning lady canceled on me so I changed my plans, rolled up my sleeves and did it myself. I was wearing a favorite lightweight chocolate brown tunic by Alternative and normally would have changed into sweats to do the housework but as my husband and brother-in-law are here, decided to stay in my best- even when cleaning. After all, they have to look at me too! There you have my somewhat random notes. I definitely sense a positive shift of feeling when I use the best things I have. By doing so I am telling myself that every day is special enough to treat myself to the best. 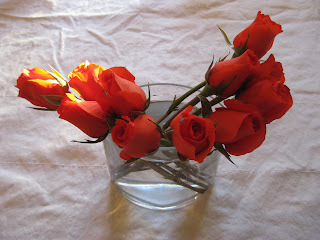 Roses on my dining room table are pictured above. Right off the bat I was very eager to help Madame Chic in the kitchen. I love to cook and I love French food so I wanted to take full advantage of learning her secrets. How was it that she managed to produce a delicious three-course dinner every single night without even so much as glancing into a cookbook? It was simple- she had been making these recipes for years and they came to her like second nature. One of Madam Chic’s specialties was dessert- there was always dessert, and it was toujours delicious. My favorite of her desserts were her fruit tarts. They went from apple in the wintertime to strawberry as it neared summer. (Remember Famille Chic always ate seasonally. They would never dream of eating imported strawberries in the winter- not only for price and practicality purposes but because they were inferior to the sweet little local gems that arrived late spring). So early one evening, she and I were in the kitchen- the window was open and the warm Parisian breeze accompanied us as we cooked. The dessert for that evening? A strawberry tart. Madame Chic made her pâtee sucrée from scratch and I helped her roll it out onto the tart pan (which had gotten unprecedented use over the years). Then came time for the strawberries- which Madame Chic instructed me to place in the lined tart pan. 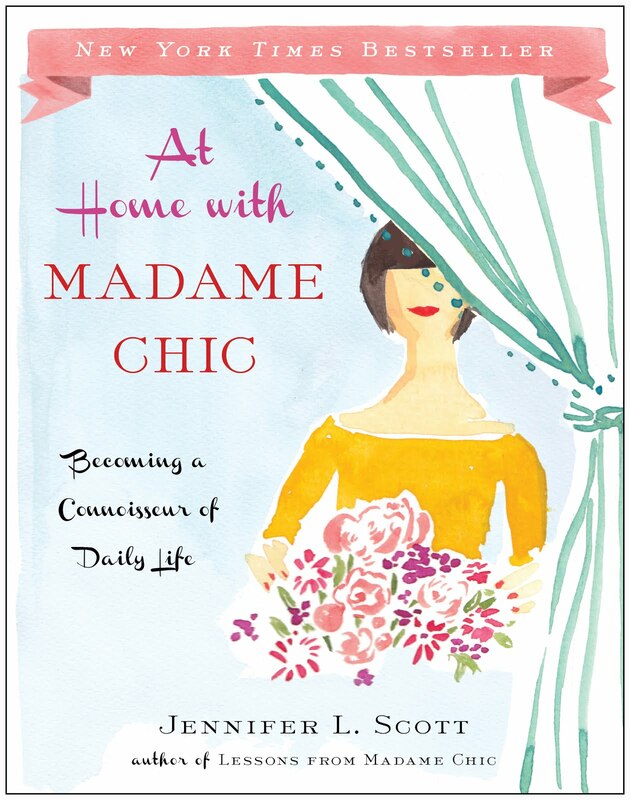 I had cut and hulled the tiny little berries and eagerly dumped them into the tart pan, rearranged them slightly and looked up at Madame Chic for the next step. 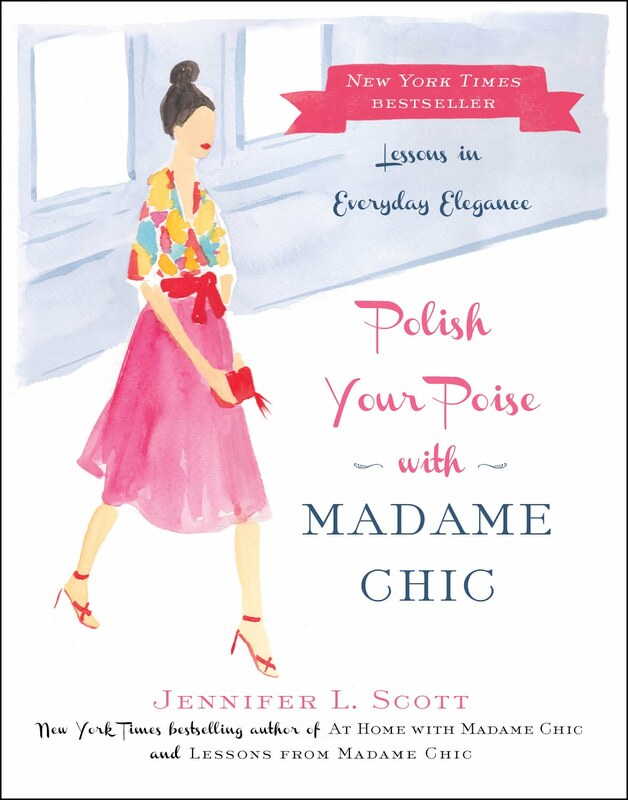 I was met, not with instructions on what to do next, but with a look of horror from Madame Chic. “Oh,” I said, looking down at my tart. I thought it looked rather nice- artistic if one were being nice. She proceeded to show me how it should be done and started to arrange the berries around the perimeter of the crust, spiraling in as she went. I finished it off and in the center we placed the nicest looking berry. Then we proceeded to drizzle on the glaze. 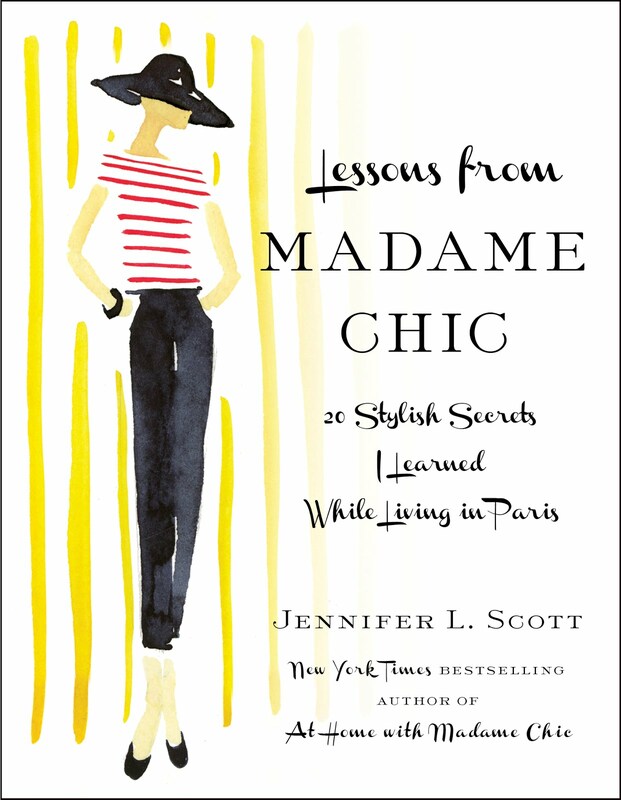 “Much better,” Madame Chic said with palpable satisfaction. 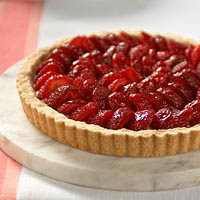 The strawberry tart from Everyday Food is pictured above. You can get the recipe here.